Gold Got Clobbered in 2013 - Will 2014 Be Different? 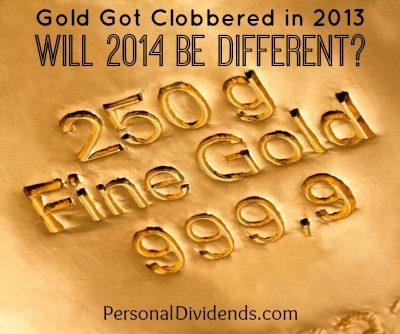 Gold Got Clobbered in 2013 – Will 2014 Be Different? Not many people are too excited about gold right now. After all, 2013 was a very bad year for gold, resulting in a price decline on the order of 28%. And that was on top of a significant loss in 2012 as well. Gold is looking like a certified loser. But that’s exactly why now is a good time to reconsider the investment potential of gold. This isn’t to predict that the stock market is going to tank and gold is going to take off, but rather that the planets may be aligned for a major shift in the investment line up. After all, it happens every few years. So why gold, and why now? Gold reached its all time high price of $1,908 per once in August of 2011. Ever since, it’s been stair stepping down, and is now hovering in the $1,250 range. Though it has stabilized at that price, it still represents a price decline of about 35% over a space of two and a half years. Given the size of the decline, and the length of time since the last price peak, it appears that gold is in a certified bear market phase. If you invest in gold right now, you’ll be buying when it’s “on sale”, at least compared to its peak price. Though many investors follow the herd, buying into an investment only when everyone else is, it’s usually better to buy in when things are quiet and prices are stable. That will help to insure that you won’t get caught buying at speculatively high prices, as was the case in 2011. If you believe in contrary investing – buying when an asset class is out of favor with the general investing public – now could be the time to enter or (re-enter) the gold market. No many investors or investment advisors are recommending gold right now, and the media has soured on it (if they were ever keen on it at any time). This gets back to basic investing – buying when everyone is selling, and selling when everyone is buying. If you buy now, when gold prices are down, you’ll have a better chance of riding the next wave up. Your advantage will be that no one else is paying attention, and you can build your position in a sane, stable market. Though stock prices have backed off a bit since the very beginning of the year, they’re still flirting with record levels. Where paper assets are concerned, now may be the time to begin selling – while everyone else is still buying. This could also be a sign that gold is about to rebound, since metals tend to move in the opposite direction of paper assets. The US Federal Reserve has already announced the tapering of the Quantitative Easing program (QE), meaning it will begin reducing it’s ongoing purchases of US Treasury debt and mortgage bonds. This is already having a noticeable affect on interest rates, causing them to rise since last May. Rising rates cause bond prices to fall, and stocks usually follow. An investment changing of the guard may be taking place right now, shifting emphasis from paper assets to alternative investments, including gold. The economic expansion since the end of the last recession has been spotty at best. Growth varies from one country to the next, and even from one region to another within the same country. There’s evidence surfacing that the economies of several developing countries, including Thailand and Turkey, may be on the decline. As we saw with the “Asian Contagion” of the late 1990s, economic troubles often begin on the fringes, such as the developing countries, then spill over into the larger economies. Gold prices tend to respond favorably to news of crisis and instability, particularly when it takes place internationally. We may be seeing the early signs of that right now. Despite the fact that conditions have calmed significantly since the financial meltdown, the state of global finances remains both complex and strained. Countries all over the world are dealing with continued budget deficits, pension funding shortages, and rising healthcare costs. And there are trillions of dollars in derivative instruments that don’t seem to be entirely understood by either the financial markets or central banks. Systems that are that complicated are subject to hiccups and worse. When these play out, gold tends to be the big investment winner, as people move out of the uncertainty of encumbered financial instruments, and into the simplicity of precious metals. None of this is to say that the world’s financial situation is about to blow up sending gold prices to the stars. But there’s no question that everything is tightly balanced and subject to disruption. In that kind of environment, having just a small position in gold could reap big returns. And now might be the perfect time to get in to it.